The crew on Henry Selick’s untitled stop motion animated film were told this afternoon that Disney is not proceeding with this project. Though the film had no title, it had a October 4, 2013 release date, and about 150 San Francisco-based artists ready to go, so it’s a blow to the animation troops out there. Started shooting last summer, but I’d heard it just wasn’t coming together in a manner that pleased the studio. Selick has been given the chance to take the project to other studios…t’s unclear what this does to his plans to helm Neil Gaiman’s “The Graveyard Book,” a project Disney acquired in April. Sources close to the production said from a creative and scheduling standpoint, the pic wasn’t where it needed to be to meet its planned release date and [Disney] decided not to continue production as a result. While the pic had been in production since last summer, Disney had yet to hire thesps to voice characters. Studio also had yet to reveal any artwork from the project during its production or as promotional materials, making it easier for another distributor to pick up the film. One of the more interesting stories in the world of animation last year was the very public collapse of the Henry Selick's newest movie with Disney, something that was supposed to be the beginning of a very long and fruitful relationship for the "Nightmare Before Christmas" director and the studio. But alas, the film that was at one point designed to be Pixar's first stop motion feature completely fell apart after Selick continued to lock horns with the Pixar Brain Trust (whose story-comes-first mandate ruffled Selick) and Disney execs over the tone of the movie and its lack of narrative clarity. After building the animators a new studio and paying for a large chunk of the production budget, the project formerly known as "Shademaker" was indefinitely canceled. Now comes word that the movie, now entitled "The Shadow King," is up and running again, this time produced by "Beasts of the Southern Wild" principle Josh Penn, with funding by K5 International. 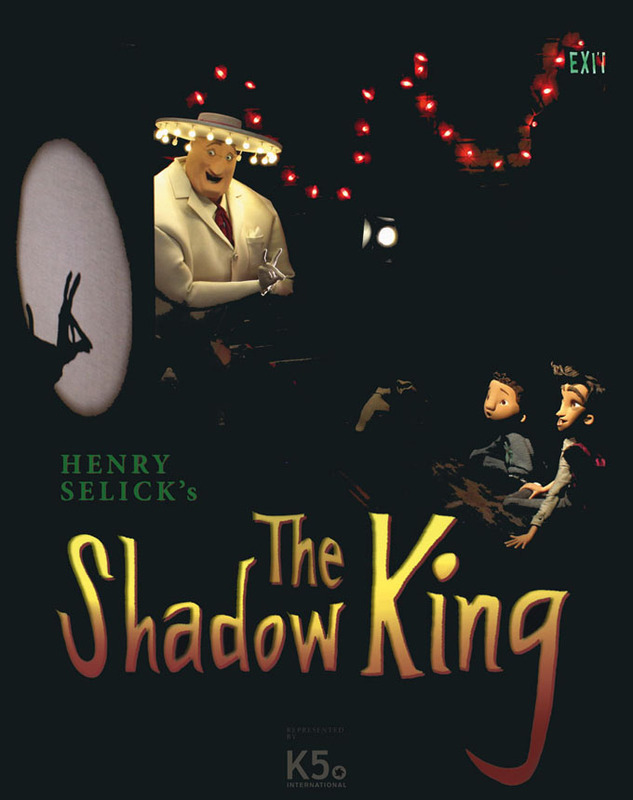 The report states that Selick will screen footage from the incomplete work, which the report says concerns a young boy with elongated fingers who can create shadow creatures that are useful in combating an evil monster who wants to murder the boy's family and destroy New York City (that old story), at the European Film Market in a few days. With a movie to sell, a quick sales poster has been put together with a first look from the movie, and the voice cast has been revealed with: Jaden Betts as Hap, Pamela Adlon as Richard, Brendan Gleeson as Darce, Jeffrey Tambor as Cuzzie Bell and Catherine O’Hara as Miss Fern. It will be interesting to see what becomes of Selick's Cinderbiter Studio, which Disney had set up. Keep in mind that Disney had already tried this once before with Guillermo del Toro for his Disney Double Dare You shingle, which got bogged down (and ultimately undone) by del Toro's prolonged involvement in "The Hobbit" and by the fact that the first "test film," "Don't Be Afraid of the Dark," got an R-rating when it aimed for PG. (Disney ended up selling it off for release.) Many of the principles, including former Pixar designer Lou Romano, are named in the report, so they have clearly stuck around, despite much of the crew being fired when word came down that Disney was pulling the plug. At one point Selick's old bosses at Laika, who produced the director's Oscar-nominated "Coraline," looked like they might step in, but that didn't happen. Another Cinderbiter/Selick project for Disney, a stop-motion animated (or, in one scenario, partially stop-motion-animated) feature adaptation of Neil Gaiman's brilliant children's novel "The Graveyard Book," which seemed pretty doomed once "Shademaker" was canceled, was also recently revived, this time with Ron Howard in the director's seat. Because if it's one thing Ron Howard knows, it's how to be spooky. Later this month marks the 20th anniversary of Henry Selick's "The Nightmare Before Christmas," a delightful stop motion fable from the imagination of Tim Burton and Disney that would eventually become something of a cultural phenomenon, complete with a yearly holiday redo of Disneyland's Haunted Mansion attraction and untold millions of dollars in merchandise sales. In the years since though, Selick's career has been unusually spotty, culminating in the out-and-out disaster that was his deal with Disney and Pixar to create four original films, which ended before the first movie could be completed (the studio terminated his contract and lost $50 million on the project). Well, never count a good animator down. FilmNation has just hired the director to helm "A Tale Dark & Grimm," a live action adaptation of a children's book by Adam Gidwitz that reinterprets the original Grimm Brothers' fairy tales. What's interesting about this is that it isn't an animated feature. This is, from the sounds of it, a completely live action film. Selick's involvement in live action is even more worrisome than his animation work, with the first half of Disney's "James and the Giant Peach" and most of the disastrous "Monkeybone" being realized with real people, both to truly terrible effect. One of the movie's intended for his Disney/Pixar deal was a live action/animated adaptation of Neil Gaiman's "The Graveyard Book," which would have been pretty phenomenal if ever realized, and this seems to be sort of along the same lines, as it "follows two unsuspecting children who run away from their own dark fairy tale in search of a better life only to find themselves amidst eight other tales just as fearsome." Could work. Selick's last film, the aborted Disney project "The Shadow King," is in some unfinished state, despite Selick vowing to try and sell the film at this year's European Film Market (nothing ever came of it). He had a whole crew and a new studio called Cinderbiter that Disney had built for the project, whose core creative team included many Disney and Pixar vets, including Lou Romano, the talented story artist and voice of Linguini in "Ratatouille." Who knows if it will ever see the light of day. While any new project from Selick is reason enough to get excited, we can't muster much enthusiasm for a live action feature. The director has never been gifted in this department, although we imagine there will be some aspect of stop motion animation involved in "A Tale Dark & Grimm." Fans of beloved animator Henry Selick have been very patiently awaiting something new from the director since 2009’s “Caroline.” Despite lining up a slew of projects — “Wendell And Wild,” “A Tale Dark & Grimm,” “The Shadow King” — nothing has come of them, but now something new on the horizon could finally see Selick’s talents on display once again. THR reports that Anthony and Joe Russo (“Captain America: Civil War,” “Avengers: Infinity War“) are developing and producing an adaptation of the video game “Little Nightmares,” with Selick directing the pilot and possibly other episodes as well. The material sounds right up Selick’s alley, telling the story of nine year-old girl Six who is trapped at the bottom of the terrifying ship called Maw, and tires to escape while taking on villains such as the Janitor, the Twin Chefs and the Lady. I'd say Selick is a good fit. Fresh off winning the Best Original Screenplay Oscar for his directorial debut Get Out, Jordan Peele is at the center of a most intriguing feature re-team with Keegan-Michael Key, his longtime partner on the Emmy-winning Comedy Central series Key and Peele. Netflix has committed to finance and distribute Wendell and Wild, a stop-motion animated feature to be directed by James and the Giant Peach helmer Henry Selick. Key and Peele will supply the voices for two scheming demon brothers. Pic is based on an original idea by Selick, the stop-motion virtuoso whose other films include Coraline and Tim Burton’s The Nightmare Before Christmas. Selick is separately developing a television adaptation of the video game Little Nightmares with Joe and Anthony Russo’s AGBO. Selick is writing the script with Peele and Clay McLeod Chapman. While the movie moves forward, a deal has been made with Simon & Schuster for a book to be written by Chapman and Selick to be published around the film’s release. Acclaimed Argentinian artist Pablo Lobato will be designing the characters for Wendell and Wild.